I look forward to summer. Not only to spend quality time with my family and friends, I look forward to teaching inservice teachers about the music classroom experience. This summer I taught two classes at Oakland University in Michigan. The first class was called Teaching for Musical Understanding using Technology. 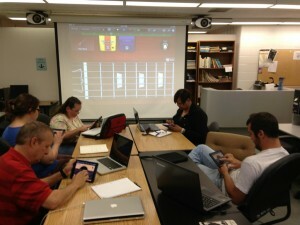 This is an introductory class on how to support musicians in the music classroom with various web 2.0 tools and iDevices. The class that I am teaching now is specific to GarageBand and its place in K-12 education, specifically the music classroom. I frame this course at the intersection of creativity and technology. 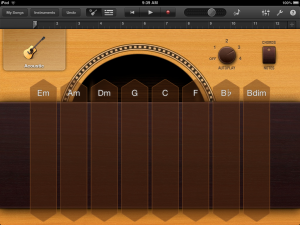 In this post I will be focusing on the GarageBand iPad app. GarageBand is quite an incredible app, both for the Mac and iDevice. There are many points of entry for musicians at various levels of experience. 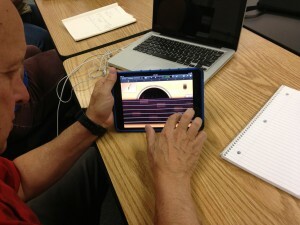 We discussed GarageBand for iPad as an instrument, recording device and composition tool. We created original pieces and arranged other people’s music as we discussed the ways this technology could support the musician as they engage in authentic processes. What is a scale? Why do some notes fit into a chord progression better than others? How are these notes organized? I created a simple chord progression (C-Am-F-G) using an iPad’s smart guitar and the autoplay knob, which allows you to select a variety of built-in comping patterns. 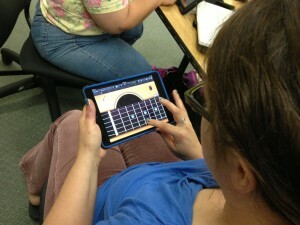 The teachers used an iPad melodic instrument set to notes to improvise during the chord progression. This required the musicians to use their understanding of whole and half steps while staying in the chord structure. Some teachers chose instruments that they were not familiar with like the guitar fretboard of violin neck. The struggles began. The fretboard is laid out chromatically and in 4ths. It was difficult for non-gutarists to gain an understanding of the fretboard and the intervals from string to string. I then asked for them to figure out the melody to Heart and Soul (which is supported with the chords I originally recorded). There were a few musicians that were able to problem-solve parts of the melody, and others struggled to understand the fret board. We then set the scale to major. This limits the notes to the diatonic pitches of the key (in this case C major). When the obstacles are moved and the musicians are able to engage with the sound, all were able to easily perform the melody on the iPads with the accompaniment. This created a doorway in to engaging with the sound first and how those pitches work together. The sound is what makes the scales meaningful. Many student musicians are blocked by the constraints of the # and b to consider the sound that connects to the accidentals. Below are reflections of the music teachers who were in my MUS609 iPad/GarageBand in General Music at Oakland University in the Summer of 2013. Hoping that this was not going to be like the labor intensive Finale workshop that I had attended years ago, I enrolled in Oakland University’s Garage Band class. I knew that I needed more time to fully understand GB and all of the uses it offers a student-centered creative class room. I had hoped to be able to learn how to use this specific application better. I had thought that GB was much more like Finale, which has steps to be done in certain order that can not be changed later. However, I now know that GB can be accessed across the spectrum of educational settings and age groups. GB has many entry points, much more than most applications. Since students are very curious and creative, they need a tool that will not stand between the learner and their understanding of a concept. GB is user friendly. The iPad version even automatically saves the song as the window is shut. I now know, with over 20 years of using computer based tools, if you only have room for one tool … THIS is ONE tool to have. As I think about all of the classes I am taking this summer, this class has been most beneficial. It has been more beneficial to me because I can implement these techniques right away in the classroom. I had never heard of a garage band app but upon using it in class have found it to be very useful especially in composing music. Since I am having my students compose more in my classes the garage band app would certainly take us to another level in this process. The instructor was excellent, the assignments were relevant, and the class was exciting. The instructor was also very accessible and willing to help with assignments and questions both before and after class. I would definitely recommend this class to other music educators. In reflecting back on the iPad and garage band class that I am about to complete, I view the class more about learning ways to teach creativity in music. The technology is a very helpful tool (one that many of our students are currently more literate than us) in figuring out ways to teach creativity. Before this class, I had previous experience in using garage band in both the mac computer and the iPad. I had used the mac version in a previous technology class, but had not used it with my students. I had used the iPad version to arrange a song with my students (BTW I teach elementary music k-5). Some of my struggles in figuring out how to move forward and do more with these programs were trying to figure out how to implement the lessons when I do not have the resources for every student. I think the best way to deal with that would be to think of the iPad as an instrument and be able to have students take turns playing it, just like we do when we are playing non-electronic instruments in class. Other ways I could work around that limitation would be to have centered-based activities where working on the iPad would be one of the centers. Partner or group projects would be another way this can be done. I feel my strength as a teacher this past year was teaching students skills and aspects of music (finding their singing voice, matching pitch, learning to read rhythms, etc.). I have been very choral based in my approach. I have seen improvements in many students and I can tell that most of my students are enjoying singing and making music this way. That being said, there is a percentage of my students that I have not been able to reach this way and I can tell are not enjoying music class. This coming year, I would like to tweak my approach to a more balanced way of teaching focusing on teaching more creativity through composing and arranging (using the technology that we have been discussing in class). I do not want to throw out what I have been teaching (I still think those aspects are important to learn to be a well-rounded musician), but I think teaching the creativity will make those aspects more intrinsic for the students to know. My hope and plan is that by teaching the creative side of music, I will not be taking time away from teaching the more traditional aspects of music, but instead I will be able to implement them in a more meaningful way for the students. Reading what I just wrote, I noticed that I mentioned technology very little. I think that was one of the purposes of this class. I view it not as a technology class, but a class that taught me to think about how I can teach creativity so my students will be the ones pushing for their own education. I also realize that in order to improve my teaching, I need to be willing to step outside of my own comfort zone in the activities that I implement in my class. If I do not, I will continue to reach my students that will probably be successful with or without me, but leave behind the students that need a different approach to learn. Upon reflection of the last 4 days of this class, I have learned how a constructivist classroom introduces GarageBand for music to use in many creative ways. Musical problems should not be all about the software and the how-to use the software. As one example, we had to show level of understanding using GarageBand to create a Podcast. It was important to note that we did not get a lesson on GarageBand. That was on a need to know basis. When you give us a problem we find out what we need to know in-order to create the podcast. I appreciate that the teacher Mr. M. gave the class a model of what we needed to do. We learned not only how to create a podcast, but we learned about the useful ways to introduce music to your class that nurtures creativity. iPad is a wonderful tool to allow students to experience music in many ways. When you want to move your finger up that something cool can happen and they are able to make it sound musical and original. I believe it is a great to grow in making musical choices that previously would not be available to an inexperienced musician. They can create with minimal help. Georgio Moroder, pointed out that when you are able to free your mind about musical elements such as harmony or having to worry about music being correct, you can do whatever you want. Nobody told him what to do with no preconceptions of what to do. After I heard that I said, we as teachers need to leave the preconceptions out and allow the student to just decide what to do. Isn’t that what people are always telling the kids what to do? The music environment is the one place that they do not need to be told what to do, but to allow them the freedom to make their choices. I also wanted to say that iPad is a useful instrument that allows the student to by-pass the difficult aspects of creating music and take a leap in growing creatively. Prior to taking these last two classes I had no idea the learning potential that is available. I have benefited much. Thank-You, it was helpful to me. This entry was posted in GarageBand by mmedvinsky. Bookmark the permalink. Fred-I forgot about the fact that our entirety of using Garage Band was on a need to know basis. He did not give us steps to learn it at first (which I probably would have listened with glazed over eyes and the info might not have stuck). This was a good model of the way I would like to implement projects in my classroom (learning with the final product in mind). Mike-One thing that stuck out for me about the class and what you wrote was when you had us trying to play a melody on the guitar app. What I wanted musically was in my head, but I did not have the technique to translate it on the instrument. This is the mentality of many of the students that we are all teaching. The challenge for us as teachers is getting the music that is already in our students’ heads and helping them put it into sound that they can share. Traditionally this has been done by teaching students how to play live instruments (which might take years to learn the technique they would need, depending on the complexity of their internal music). The technology gives the opportunity for younger children to create music without having to be a master at a live one. Robin-I really agree with you at the speed of which we can implement some of these activities. If I had class tomorrow, I could make a garage band loop and have my first graders improvise on a set scale over them. There is a lot of ease in setup with these programs, while at the same time being in depth enough that I would be able to do more complex activities and projects with my older kids. I concur with the fact that Garage Band is a much easier app to create music and certainly easier for novice musicians to experience and create music. In the area of composing music we can create a lesson for the students using GarageBand with ease. There are many doorways for the learner to find what is comfortable for them to experience music. When you have a activity where you are using centers, the iPad can be used in one of the centers or stations. Kathy-I like how you mentioned that this is ONE tool. It is important to realize that this tool is one of many that we use in our classroom and our music class is balanced in teaching students how to be creative while also teaching them to skills they need in order to fulfill their own creativity. We must also be prepared to continue our education and keep up with the latest in technology because these devices will continue to evolve over the years and if we do not keep up, we will be left behind. Upon reading the above, I noticed a hidden common theme woven between all 5 original entries. The focus of the classroom is moving quickly towards student-centered classes. Our profession is divided between the ‘old Journeyman vs. Apprentice vs. novice’ hierarchical set-up, which sets limits of learning potential that do not really exist AND the colaborative-based class, which supports and includes everyone AT their point of understanding. In order to support each of the goals in these various classrooms, the educators are stretching to find new ways to communicate their curriculum and benchmarks without forgetting the concepts of true MUSIC education. The app GarageBand, allows for this sharing of ideas while supporting the learners at so many different levels of understanding. Best of Luck to All. 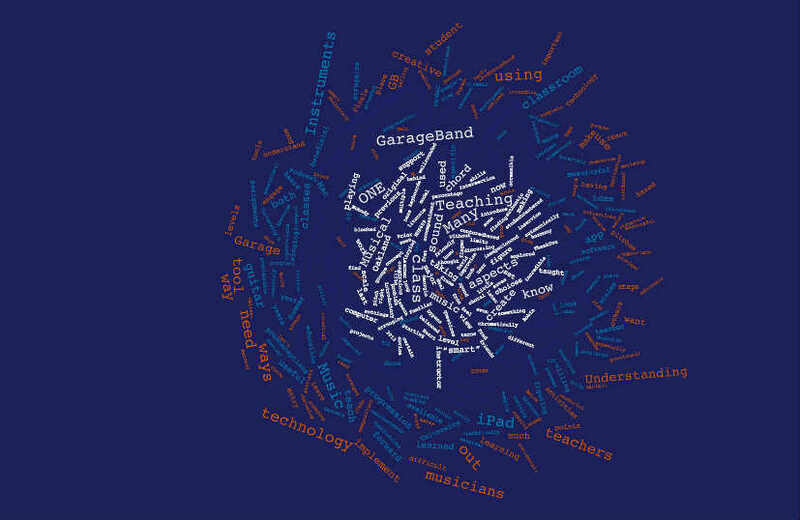 Some of my struggles I have had previously in teaching composition in my classroom can be solved with the Garage Band App. Since GB has many entry points I know this app would help my students compose and be a groundbreaking experience for them. As I continue to implement teaching in a student-centered classroom I can also see where having only one IPad could be very rewarding and beneficial to my students. The students could partner in groups or take turns working on their compositions using this app. Students can also learn how to experience music in many different ways. They can learn how to compose music and not be held up by musical elements which will allow them to just create with freedom!